CALGARY — Mika Zibanejad had a natural hat trick in 2:38 in the third period to help the Ottawa Senators rally for a 6-4 win against the Calgary Flames at Scotiabank Saddledome on Saturday. Zack Smith, Nick Paul and Jean-Gabriel Pageau scored, andCraig Anderson made 34 saves for the Senators (30-27-6), who have won five of their past six games. Zibanejad’s hat trick, the first of his NHL career, was the fastest in Senators history. Marian Hossa held the record at 7:05, set Jan. 2, 2003. Johnny Gaudreau had two goals and an assist, and Joe Colborne and Sean Monahan scored for the Flames (26-31-4), who have lost four straight games (0-3-1) and seven of eight (1-6-1). Trailing 4-2, Zibanejad started Ottawa’s comeback with his first of three consecutive goals. He pulled the Senators to within one at 6:10 of the third by beating Calgary goaltender Joni Ortio to the short side with a shot from the bottom of the left faceoff circle. At 7:59, Zibanejad tied it 4-4 with his second goal. Alex Chiasson‘s shot was blocked, and Zibanejad picked up the rebound and beat Ortio. Flames coach Bob Hartley challenged the goal, claiming Bobby Ryan interfered with Ortio, but video review confirmed there was no goalie interference. Zibanejad completed his hat trick 49 seconds later, lifting a pass from Mark Stone over a sprawled Ortio to put the Senators up 5-4. It was Ottawa’s first natural hat trick since Jason Spezza‘s on Oct. 15, 2013. Zibanejad had 11 goals in 61 games entering the game but none in the previous nine. Pageau scored into an empty net at 19:00. The Flames scored on consecutive shots in the first period to take a 2-0 lead. On the power play, Ortio hit Mikael Backlund with an outlet pass just outside the Senators zone. Backlund left it for a streaking Sam Bennett, who skated in and found Colborne in the slot for a shot between Anderson’s legs to put Calgary up 1-0 at 6:24. Monahan doubled the lead at 7:06, taking a pass from Gaudreau and circling to the right faceoff dot before beating Anderson short side over his glove to give the Flames a 2-0 lead. Gaudreau has a career-high seven-game assist streak. Smith cut the lead to 2-1 with 1:39 remaining in the first. On the power play, Karlsson’s point shot through a screen hit Smith and deflected by Ortio. Ortio was sharp in preserving the lead early in the second, making a sprawling save with his arm against Smith 30 seconds in and gloving Mike Hoffman‘s shot from inside the top of the left faceoff circle at 3:02. He followed those up with two saves against Stone, first getting a pad on his partial breakaway at 5:58 before getting a shoulder on another shot at 8:54 after extended pressure from the Senators. Gaudreau put the Flames up 3-1 at 10:23. After forcing a turnover in Calgary’s end, Gaudreau took a pass from TJ Brodie and got a step on Karlsson before snapping a shot over Anderson’s shoulder. 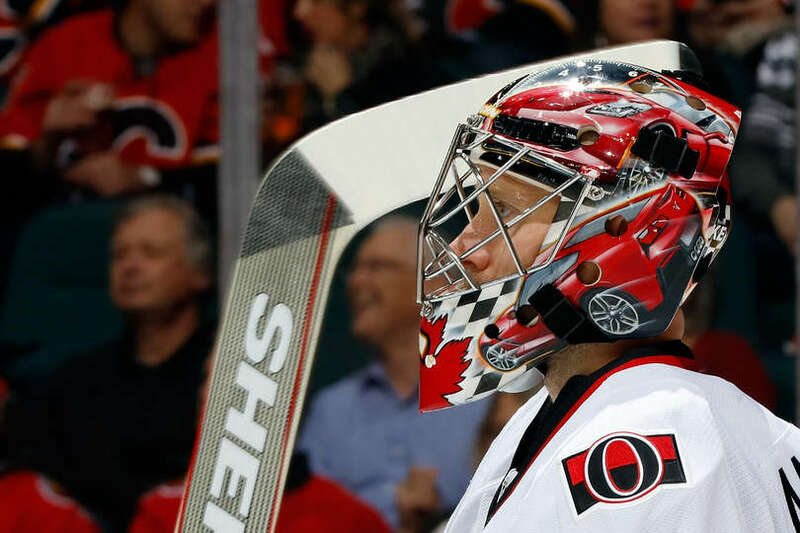 Paul pulled Ottawa back to within one, but Gaudreau again restored the two-goal lead, snapping a shot by Anderson’s blocker off the rush with 22.5 seconds remaining in the period. With the goal, his 24th, Gaudreau matched his rookie total in 80 games last season.